Why should you start a business in Bradford? Nestled at the foothills of the Pennines in the heart of West Yorkshire, Bradford rose to prominence as a city during the industrial revolution as a centre of textile manufacturing – earning it the title of “wool capital of the world”. Though the city fell prey to mass de-industrialisation during the 20th century, in recent years the city has undergone regeneration and an innovation boom that has seen its economy grow significantly. The city has one major university The University of Bradford – two time winner of the UK’s greenest university. Bradford is well served by rail; less than 20 minutes commute to Leeds and around an hour from Manchester – both major Northern Powerhouse cities. Leeds Bradford International Airport is located approximately six miles outside the city to the North East so air travel to global business centres is certainly accessible. There are around 87,500, individuals with an NVQ Level 4 and above in Bradford, equating to around 26.8% of the city’s population. This is amongst the lowest level in the whole country significantly lower than nearby Leeds, but hardly surprising given that Bradford only has one university compared to Leeds’ three. The University of Bradford, which has recently undergone an £84m refurbishment, rose 20 places to be ranked 52 in the Guardian University League Tables 2017, while the University of Bradford School of Management is ranked first in Yorkshire and a respectable 11th in the UK and 42nd in Europe. At £473.50, average weekly earnings for Bradford are lower than the £480 for Yorkshire & The Humber as a whole and comparable to cities such as Swansea (£470.80) and Manchester (£467.50) so, while the pool of skilled staff is smaller, talent is more affordable. Bradford City Council is a signatory of the Small Business Friendly Concordat: a commitment from local government to advise and support local enterprise and foster innovation – particularly among those who might find more obstacles to starting up such as ethnic and minority-owned businesses, women-owned businesses and social enterprises. Invest in Bradford provides free support from a team of experienced business advisers and coaches who can advise on everything from creating a business plan and finding premises, to raising start-up finance, marketing your product or service, registering as self-employed, your first year tax return and becoming an employer for the first time. The Kickstart Enterprise Programme can direct you to a number of organisations that offer business coaching, networking opportunities, workshops, co-working space office rental. Elsewhere, the Bradford Chamber of Commerce has a host of support for local businesses. Membership perks include business promotion to clients online and through networking, and protection in the form of a legal helpline and employment advice service, as well as money saving with private healthcare, debt recovery services and banking. The Chamber of Commerce also offers support for international exporters and participates in 12 international, national and regional forums. Bradford isn’t awash with funding opportunities but the website Bfunded is a great source of information about where and how to access finance in the region. The Bradford Chamber of Commerce also offers links and information on how to access business grants and funding. The Business Enterprise Fund provides finance and support for small businesses in Yorkshire and the North East. It can lend up to £50,000 for young businesses up to 24 months of trading. Average house prices in Bradford are £131,704 (Sept 2016), which is amongst the lowest in the UK, making it an affordable place to live. Only Glasgow and Liverpool (both £121) are lower. 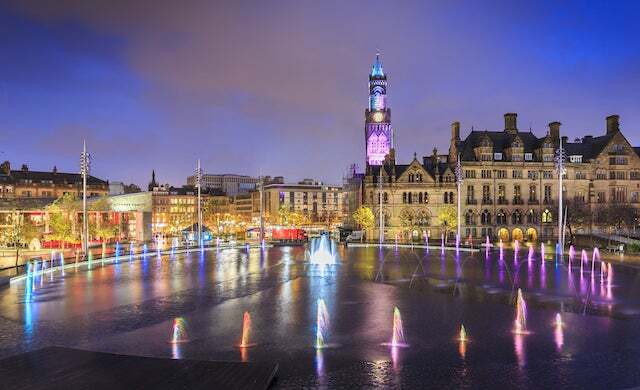 Despite some racial tension in the early 2000s, Bradford’s multicultural identity is one of its greatest assets and the city has taken advantage of its rich cultural heritage to emerge as a major tourist destination in recent years. And if you love Indian food you’re in the right place – Bradford has been named ‘Curry Capital of Britain’ for a record breaking six years in a row, being recognised for the quality of food and service offered by its restaurants, as well as its hygiene, an understanding of the sector and success in fundraising for food charities. Although it’s had a bad reputation in the past, Bradford’s crime rate is not considerably higher than cities of a comparable size and is, in fact, lower than Leeds.